Image of an older woman hunched over holding a sinuous bright yellow cat while standing in profile on a purple mesa overlooking a river or lake. She wears a green blouse, lavender scarf and navy blue skirt; her hair is red and her skin is a peachy gold. A green mountain emerges from the blue water in background. Overall, the land is orange fading to rose, and the sky is a clear lemon. Small orange and yellow flowers and shrubs peek from various crevices in the mesa. When first gazing at the painting, one can not help but notice the dazzling colors of the artist's palette. Undiluted, the artist, uses ultramarine blue, crimson and yellow in the central figures of the woman and cat, immediately drawing the viewer's eyes. The secondary colors of green, orange and violet also lead the viewer through the painting. The style of the painting is synchromistic with an emphasis on using color harmony to capture form and mood. 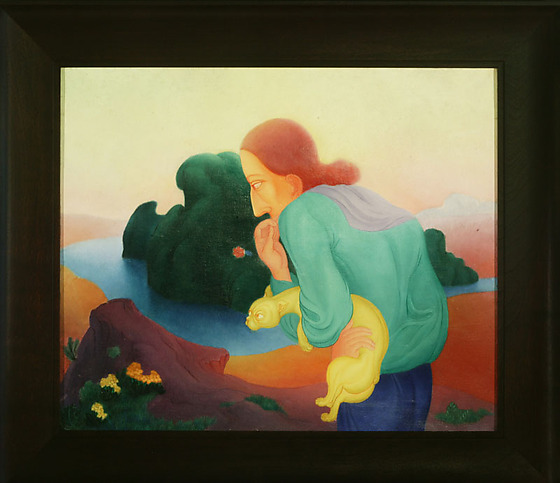 The shapes of the painting (the mountain, mesa and woman's blouse) are biomorphic and rounded, undulating with a rhythm similar to the paintings of Thomas Hart Benton, a contemporary of the artist and Stanton MacDonald-Wright. The painting is symbolic in the images it presents. The huddled and tense woman has her hand on her face and appears to be pondering a decision or awaiting something fearful. The cat stretches out his neck suspiciously. The woman is looking down at a river indicating flow and constant change and motion. The mountain or mesa top that the woman stands on is unyielding and unmoving - yang (passive) to the river's yin. One interpretation may be that the woman has to forsake an area with which is stable and unchanging and forced to confront some type of change -- unknown and potentially dangerous. It may be the woman is looking beyond the confines of the World war II concentration camp and anxious about her uncertain future beyond the walls and barbed wire.